Locally grown strawberries, whether from your own backyard or a small farm, bear no resemblance to their commercial counterparts. They’re usually small and imbued with a dense crimson color through their core – and they’re tiny bombshells of flavor. No wonder children and adults alike get addicted to the fetching berries. When strawberry season is in full swing, why not think beyond cobblers, sorbets or jams – as delicious as they are – and treat yourself to this ambrosial Cosmopolitan? The ginger liqueur and rhubarb bitters make it a sophisticated and multi-layered cocktail that will satisfy both the strawberry-loving-child and the grown-up in you. Step 1: Place the strawberries, mint and lemon juice in the bowl of a food processor. Process until liquidy, about 1 minute. Transfer to a fine sieve suspended over a bowl. With a silicone spatula, stir the purée until all the juices have been strained and only the seeds are left behind. Discard seeds. (You should have 6 oz (175 ml) of purée – enough to make 8 Cosmopolitans.) Transfer purée into a squeeze bottle or sealed container and refrigerate until ready to use, up to 3 days. Step 2: To make the cocktails – Pour the vodka, liqueur, strawberry purée, lemon juice and bitters in a shaker filled two-thirds of the way with large ice cubes. Shake until a thin layer of frost appears on the outside of the shaker. Strain into martini glasses. 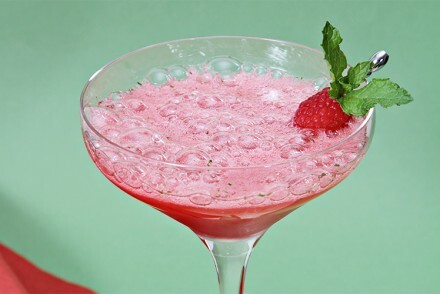 Garnish with a small strawberry and serve immediately. Just to be clear Vivanne, I am available for cocktails at your place ANYTIME!! These look so delicious and refreshing!! I haven’t been strawberry picking for years, but I remember taking my kids when they were small and we lived in Connecticut. I always felt the farmers could have garnered far more revenue by weighing people in and out!!! We have a strawberry pick your own farm near Nashville. They grow three different kinds, so there are some that are very large, but soooo sweet. I managed to leave with 12 pounds. Some are still in the freezer and I’m pinning this drink because I sure would love to be a guest at one of your parties if this is how it starts. This is really really really pretty and delightful! Oh Viviane, how have I stayed away from your most beautiful blog for so long? Your photography belongs at a gallery exhibit, your recipes are always fresh and unique….I think I’ll just kick back, wander around and sip one of these luscious cocktails while I visit! Jill! Thank you so much for your kind words – You truly made my day! I must say though, that the photography is a work in progress and probably always will be. Looking forward to perusing through your blog too – which I will do very soon! Have a great weekend… and Cheers! Very intriguing cocktail, especially the rhubarb bitters, never heard of it before. This looks refreshing for summertime after a long day at work. This looks SO GOOD!!! I didn’t know there was such as thing as rhubarb bitters, but now that I know, I have to find it! What a fabulous cocktail! MJ! Thank you for your kind words… You can find rhubarb bitters online or at gourmet stores. They’re worth the hunt – Cincin! What a delicious, sophisticated looking cocktail! I have never picked my own berries but I obviously need to get aboard that train. 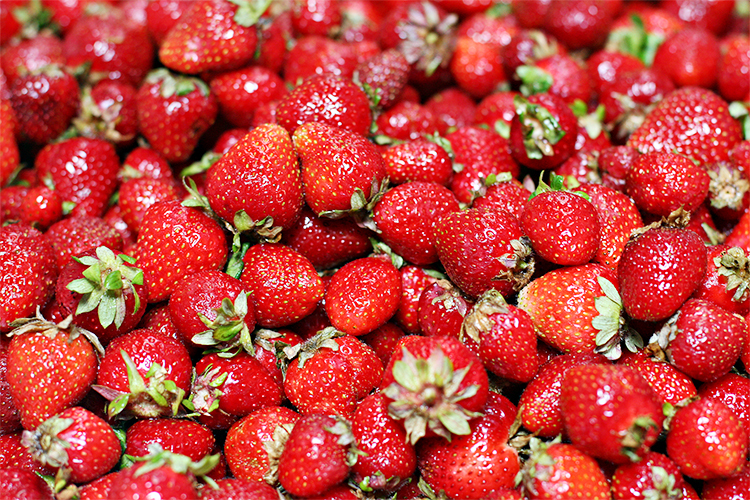 strawberry season here is usually around Father`s Day. I remember growing up and my dad would take me out with my brother on Fathers Day to pick strawberries. I continued that tradition with my kids. It is a wonderful bonding time!! This drink looks incredible Viviane. But you always impress! Steve, so sorry for this late reply… What a lovely family tradition! I wish you and your kids happy strawberry picking then… It should be coming right up! And thank you for your kind words. You make me turn “strawberry-red”… Cheers to you Steve! Very nice! 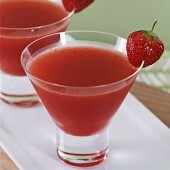 I posted a strawberry martini a couple of weeks ago but never thought to add ginger liqueur to it. I’ll have to give that a try. Anita, thank you for stopping by and for your note… I know you’ll love ginger liqueur! CCU, thank you so much! Raising a glass to you my dear! What a beautiful drink this is!! I don’t think I’ve ever seen cocktail bitters! Stephanie, cocktail bitters are one of the greatest little flavor boosters one can get. I hope you try them soon. Cheers! I’ve never seen rhubarb bitters before, but I’m intrigued. 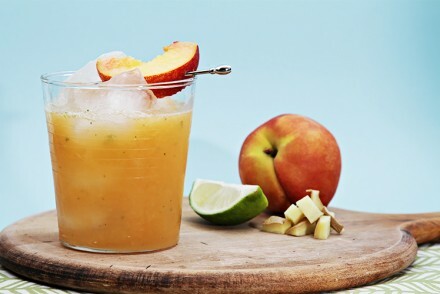 What a great-looking summer cocktail! This sounds so incredible!! Ginger liqueur! Whoa! 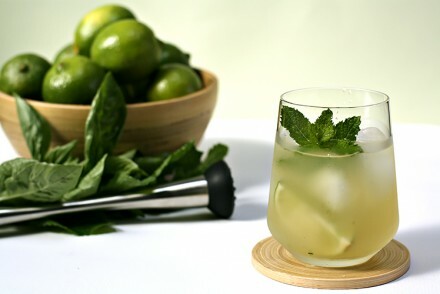 I can already envision sitting out on the patio watching the sun go down with one of these refreshing cocktails. I’ve never tried a ginger liqueur but I like tthe idea of this combination of flavors. I just may have to try this. Lovely Viviane. Suzi! So sorry for this late reply and thank you so much for your lovely note. I think you would love ginger liqueur – very aromatic! Patio, sunset and strawberry Cosmo? I’m in! Kiri! 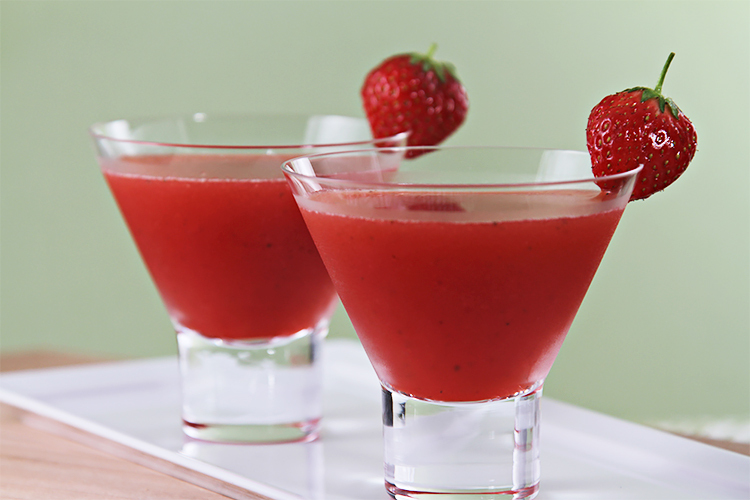 Yes… Let’s sip our strawberries! Sonia! 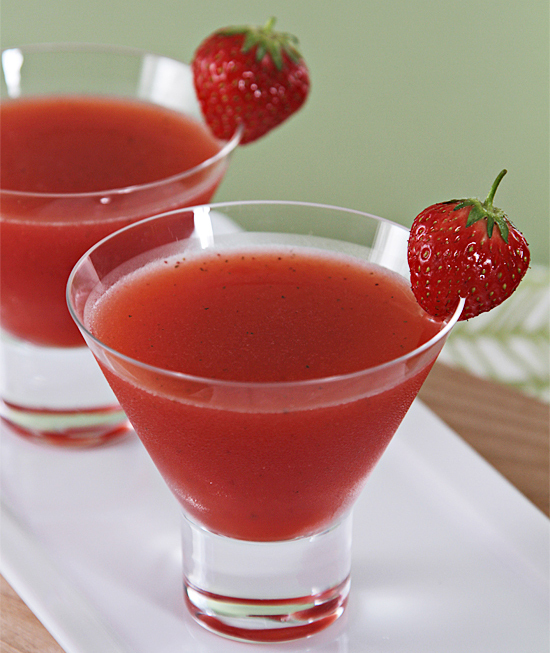 I hope you can find local strawberries on your island… Wishing you a wonderful and delicious week… Cheers! Hi Viviane! I actually am going strawberry picking today. It is the last day of the short June season here (to return for a longer time in August) and I love this recipe as a way to celebrate! I completely agree about freshly picked berries and store purchased berries. After having fresh berries I really can’t take those from the store. Hope all is well with you! Hi Toni! It’s lovely to hear from you! We picked twenty lbs of strawberries last Sunday… I’ll be making all kinds of concoctions with them today, including this Cosmo! I actually do not purchase any store bought strawberries for the rest of the year… But thankfully our local strawberry season last more than a month here in NY. Cheers my dear and happy picking!